Swansea City vs Southampton: Swansea host Southampton in a ‘winner-takes-all’ game at the bottom of the Premier League. The phrase ‘relegation six-pointer’ is a term often used too often, but it has never been more fitting for this game. Southampton sit level on point with Swansea, with just two league games remaining. Only goal difference is keeping the Saints out of the bottom three. They were denied a deserved victory at the weekend as Tom Davies struck in the 96th minute to break their hearts. Despite the late equaliser, the point was enough to lift them out of the bottom three and above Swansea. Southampton face league champions Manchester City at St Mary’s on the last day of the season, so this game is a must win. Huddersfield’s drawn with City has moved them three points clear of the bottom three, making it even more likely one of these two sides will drop into the Championship. Swansea come into this game without a win in eight games in all competitions. Despite a fantastic start to life at the Liberty Stadium, Carlos Carvalhal’s side have struggled for form in recent weeks. At home, however, they have lost just one of their last six league games, winning four. Swansea face already-relegated Stoke City at home on the final day of the season, meaning a draw would still leave them with a chance of surviving. Victory would all but seal Premier League safety for another season. Michael Oliver is the referee for Tuesday’s crucial fixture. The Englishman has an average booking points total of 37.7, the fifth highest in the league (of officials who have refereed 20+ games). As one of the league’s highest-rated referees, this a game he should be able to handle if not, the ramifications for either side could be colossal. Both sides know they can’t afford to lose this game. As a result, I think it will be quite a cagey match, with little between the two teams. Consequently, I’m punting for a score-draw, which would suit Swansea more than Southampton. 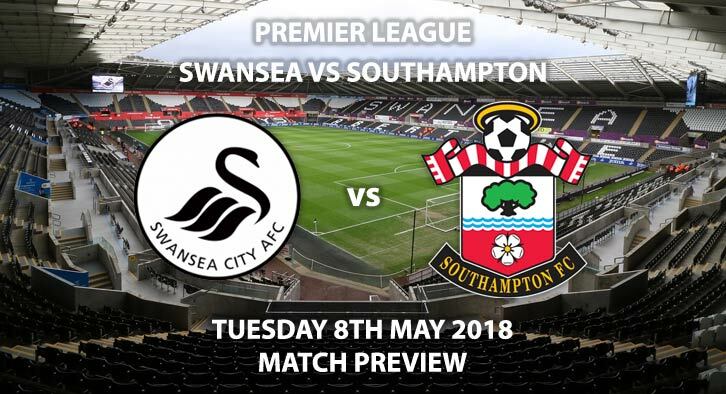 Swansea City vs Southampton will be televised live in the UK on Sky Sports Premier League HD with kick-off at 19:45. J Ayew to score first – (link no longer available). BTTS – Yes – (link no longer available). Austin to score and win – 2/1. Group Correct Score – Draw 1-1, 2-2 or 3-3 – 10/3. (NB 2). Request-A-Bet up to 10/1 – Over 1.5 goals, 3+ corners each team and 30+ match booking pts – 6/5. (NAP). SkyBet – Horse Racing/Football – Cross Sport Specials / RequestABet – Captain Simon (19.30 Ludlow) to win & Both Teams to Score (Swansea v Southampton) – 11/2. (NB). Request-A-Bet up to 10/1 – BTTS, 4+ corners each team and 20+ booking points each team – 13/2. (NBB). Odds and markets last updated on 8 May 2018 @18:58 GMT. Markets unlikely to be updated before kick off – we added the last pick (BTTS, 4+ corners) just now at 18:58. Keep visiting the tips and preview area for further updates and betting previews for more previews from this weeks domestic cup action from the UK.